Location: Kerbin Space Center Launchpad, Kerbin. I’m sure that at least one point in our lives, we’ve all looked at the moon and gazed upon it with wonder and amazement. Even those unable to look away from their smartphones have probably Googled it because someone mentioned it on TV. Anyway, there are 3 stages of thought that people go through when we look at the moon. Firstly, we’re attracted to the big glowing thing in the sky that has been with us for at least 400 years (some estimate it’s been around longer). Secondly, we think about how cool it is that we have actually travelled the 238857 miles (roughly the distance of the London marathon) to set foot on, walk around, and play golf on it. Some of us go deeper in our thoughts, and questions arise such as; where else can we go? How much did this cost? How much will the journey to the other place cost?. Ok. So, KSP might look like a laugh, and it is. However, behind the mask of funny green “Kerbals” and amusing descriptions of space shuttle parts, this is a tough one. KSP is a physics game. And to find this game easy, it requires a degree in physics, or at least some experience with NASA. Don’t worry though, as there are tutorial missions where your Kerbal friends will help you with the basics of the game, and it’s a nice rewarding feeling when you at least get into orbit above the planet. It doesn’t end there though. There are seven planets in the solar system, and each feature their own personal traits such as gravity and atmosphere (all things to consider when trying to avoid becoming the proud owner of a smouldering wreck on some distant planet). The Moon Botherer Mk I. There were no survivors. To get within reaching distance of your celestial neighbours, you’re going to have to arrange all kinds of scientific looking shizzle wizzle (technical term) and bric-a-brac into a vessel that will get you into space. 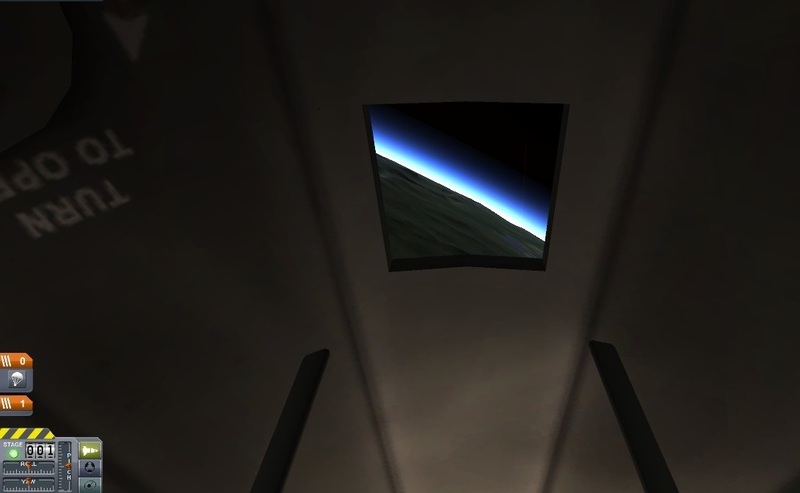 The construction stage of KSP is where you can let your imagination go free, but be warned that you still have to take into account our friend physics. I learnt quickly that if your boosters aren’t arranged properly, your ship will spin out of control like a rocket powered space screwdriver type thing. This isn’t recommended. 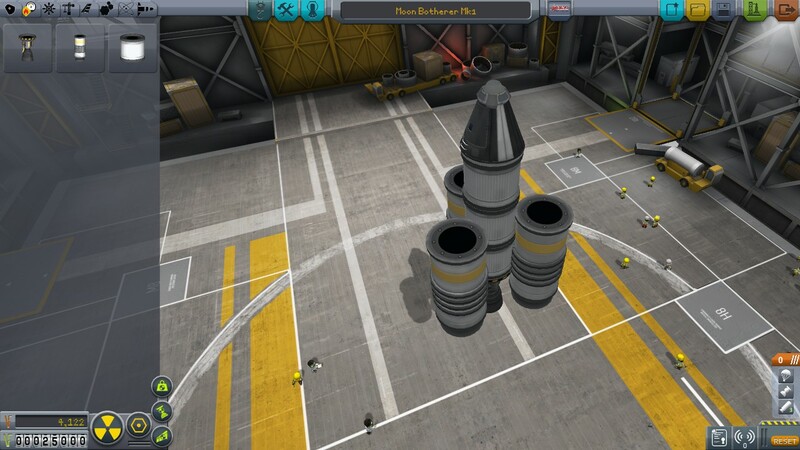 As you progress, you’ll unlock more and more items to aid you in your voyages into space, and once you’ve researched the ‘de-couplers’ you’ll have to learn the importance of staging. Really, nothing beats the satisfaction of constructing something that actually gets into space. And to land on another planet? Get the champagne ready. Unsurprisingly, in a game involving the traversing of space, science plays a huge part. In the career mode of the game, science acts as a currency that you spend on researching new technology. Running out of fuel before getting into orbit? Research new fuel tanks. Tired of the crying from the widows of astronauts? Research new parachutes and landing gear. The acquisition of science is the main goal of the game. Numerous pieces of research equipment will become available as you progress, but when you start off, you’re going to have to do it the old fashioned way. This involves getting your astronaut to get surface samples, or report what they can see out of the window. For a game with no plot, this is what will drive you to try more daring missions for the sake of taking a look at that asteroid mission control has just noticed. This is what makes KSP… KSP. It’s the mix of light hearted fun and science. In no time, you’ll become well versed in technical terms such as “retrograde” and “crew died on impact”. I haven’t even mentioned that this game isn’t properly finished yet, and that’s mainly because it doesn’t feel particularly unfinished. Sure, it’s noticeable in some parts (the surfaces of the planets are pretty barren, even your homeworld), but. considering that I’ve endured some pretty awful “completed” games, KSP is very playable. There’s plenty to see and do, and still so much that could be potentially added in the future. I’m looking forward to the future. Except the bit where the apes take over, or the soylent green bit. 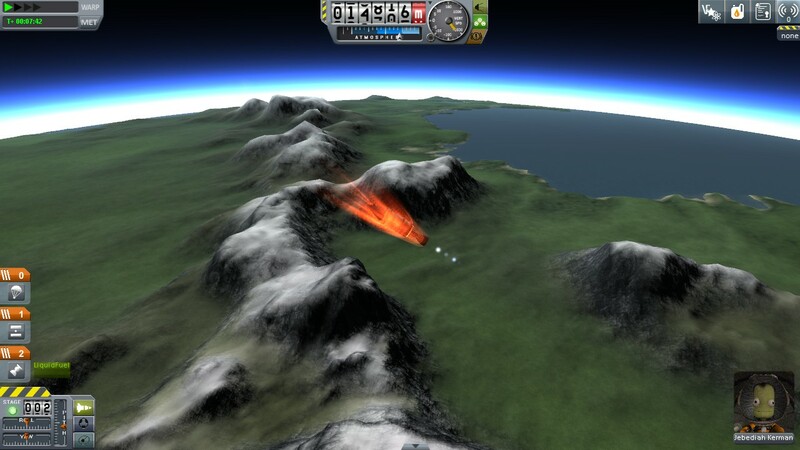 Overall, Kerbal Space Program is a pretty solid game for something still in the early stages of development. The fulfilment of building a successful vessel and getting it to another planet is truly wonderful and brings out the Ed Harris in me every time. If you need a plot, or an achievement system to keep you interested though, then this game might not be for you. With new updates, this issue is being addressed and I’m sure the game will definitely become a must have for gamers simply for it’s uniqueness. For me, this is certainly a game to watch for the future. I give it 4 Neil Armstrongs.